Anders Hjortsberg of the Profile Paintshop - well-known to readers of the Luftwaffe blog for his inspirational artworks - has completed his first decal sheet assignment for Barracuda Studios; namely two large 1/32nd scale sheets for the forthcoming Revell Bf 109 G-10. A fair few late 1944 Erla machines went to JG 300 of course and the low-res images presented here are just two of Anders' quality artworks appearing on these new sheets due imminently and forwarded to the 'Luftwaffe blog' by the artist. Click to view large..
" ..I have now read through your translation of chapter 13 entitled "Escalation" in Jean-Yves Lorant's history of JG 300 - the hairs standing up on the back of my neck! Please accept my compliments on your super text. I can't quite believe that I was right in the middle of all that - and survived !!! " This well-known image of 'Black 4' ( via Jim Crow, click to view a full screen low-res version) has up until now always been ascribed to JG 2 (or worse) in the literature and in fact doesn't appear in Vol II of the JG 300 history as I recall. However those are blue-white-blue fuselage bands which were displayed on JG 300 fighters from late December 1944 while the small black horizontal bar denoted an aircraft flying under the 'umbrella' of JGr. 300 (I hesitate to write 'assigned to'..) as in Anders' artwork of 'Yellow 6' above. 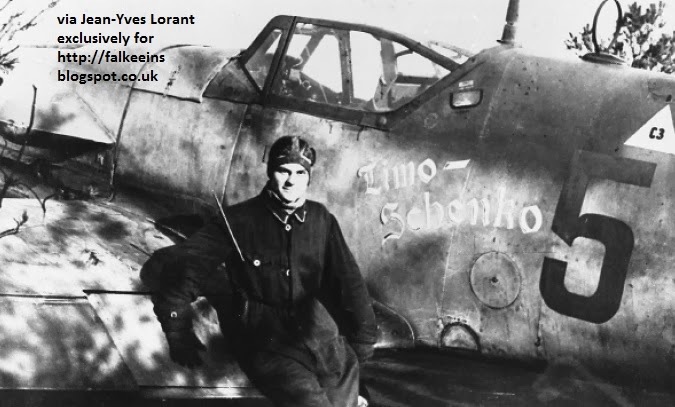 In fact this image will almost certainly be in the reprint of Jean-Yves Lorant's history of JG 300 (that the author is currently planning with more photos and more accounts - you read it here first! ) Anders' superb artwork of this machine appears on sheet 2 of the new BarracudaCals set.